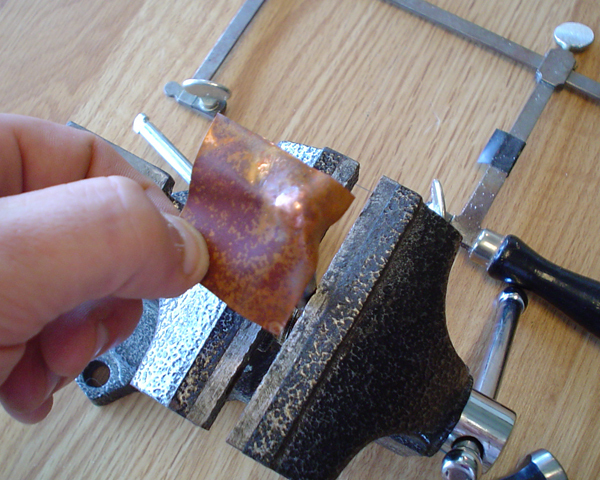 Make sure you heavily scuff the metal to give a good surface to stick to. 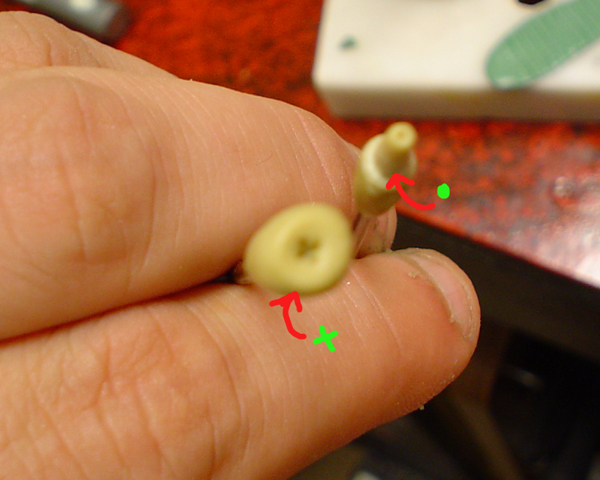 I also perforate the metal with a pinvise so that the gs can form through the holes and make a tight bond. The more holes the better. The problem with using metal lies in air being trapped between the metal and the putty. Once the heating process begins, the air expands and finds a way out. You must be very methodical in applying the putty to make sure you don't trap any air. I have seen some models come out completely destroyed but with a good mold. Others, with not such a happy ending. 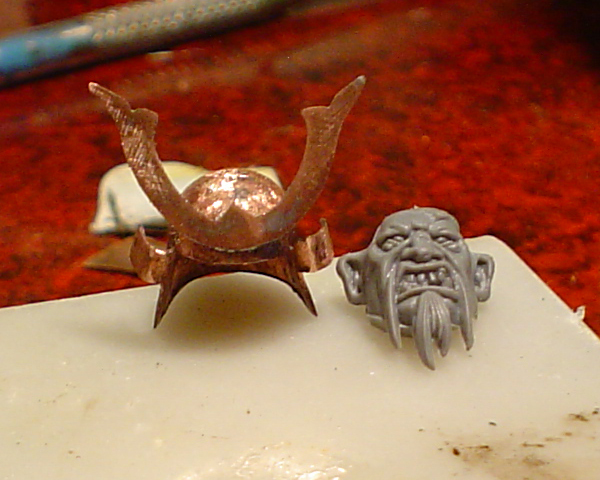 I decided to make the kabuto (helmet) out of copper because some of the pieces would be very weak if sculpted. The maedate (crest) and fukigaeshi (wings) in particular needed to be strong and I didn't want them to be thick and bulky. These are the basics and will get you going. Here are the tools I will be using. 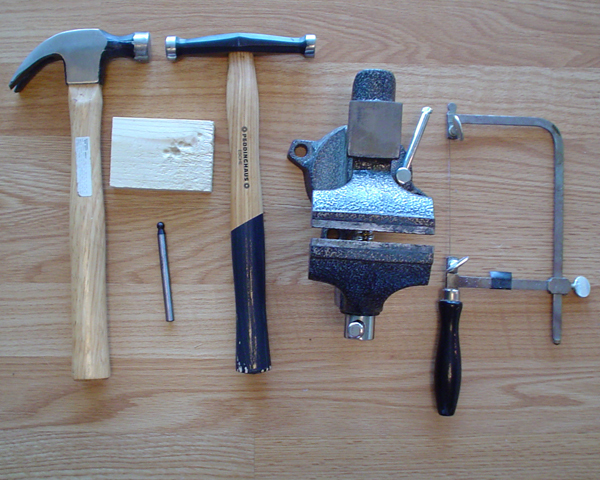 A regular claw hammer, a metal smithing hammer, a dapping stake, vise, wood block and a jewelers saw. The first step is to anneal the piece of metal you are working with. Annealing is a process of heating the metal to rearrange the molecules making it softer and easier to work with. I use an industrial heat gun for small pieces and a torch for larger pieces. Heat it to a dull cherry red and let it cool down slowly in the air. 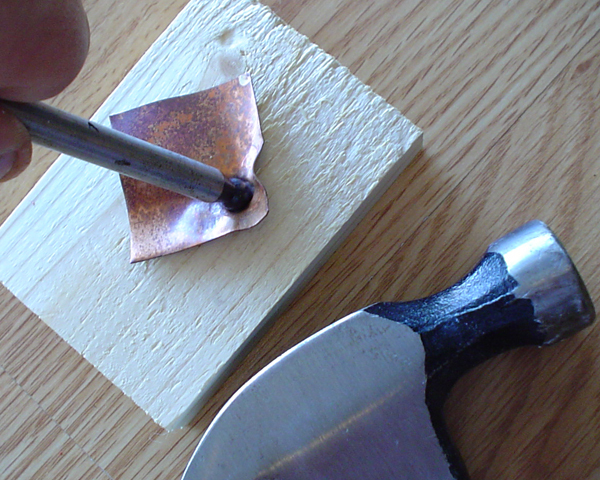 Quenching doesn't really do anything for copper but with other metals, it can harden it again. 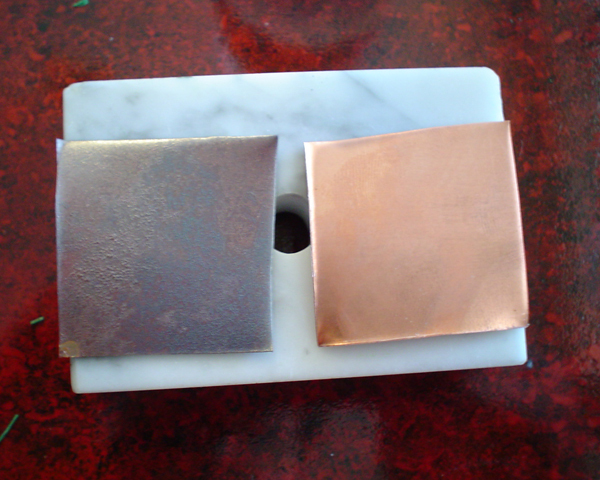 This picture shows two pieces of copper from the same sheet. The one on the left has been annealed, hence the darker color. That is firescale and can be removed later. 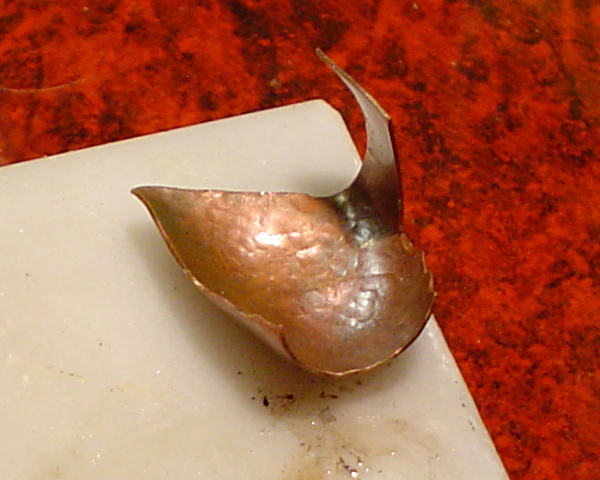 I use a Scotch pad (green dish scrubber thing) to remove fire scale from copper. I am using a dapping stake as a form so I have cranked it down in a vise. First stage of forming: Lightly tap the metal around the form while rotating the piece. Try to use a hammer with a smooth face. Any flaws in the face of the hammer will get pounded into the metal. I am using a metal smithing hammer with a polished face. Now, anneal the metal again. Forming compresses the molecules and makes it hard again. Here, I am using a block of wood and a regular claw hammer to push the stake into the metal. This process is called chasing. After the dome is formed, I carefully cut the part from the sheet using a jewelers saw. The edge of the pieces can be filed smooth. If you have any questions, please post, and be careful. 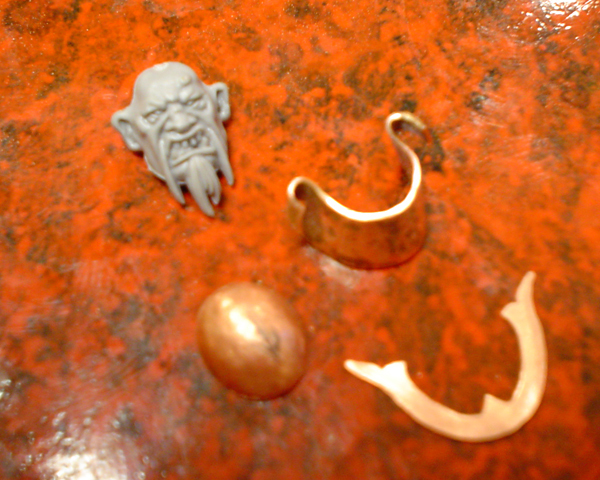 Here are some other tools I use for working with copper. 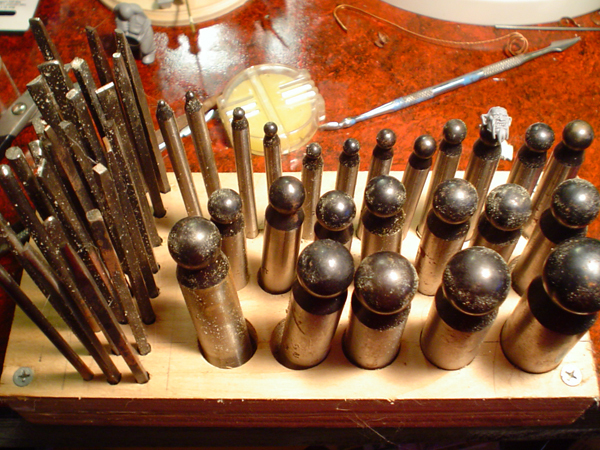 The set of tools with the round ends are dapping tools and the smaller group is a set of chasing tools. I am fortunate to have a lot of specialized tools. 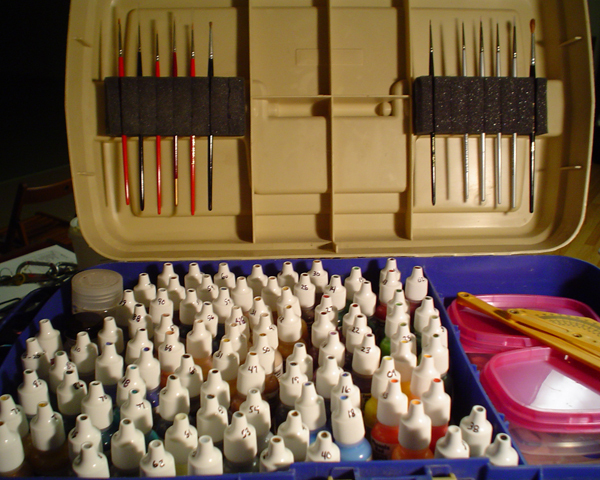 Most of the tools I use can be found at any good jewelers supply company. After getting the dome shape, I cut it out with a jewelers saw. I also cut out the maedate and a piece to shape the back of the helmet and the wings. Sorry this one is a little blurry. The parts are small. Once the parts were cut and shaped, I fired up my soldering iron and cleaned the parts so they would take the solder. I attached the dome first because it was bigger and would hold up to reheating to attach the crest. When you solder small parts, start with the biggest piece first and work to the smallest. When you heat the piece, the smallest parts will heat up first and desolder. If I had attached the crest first, it would have certainly fallen off by the time I got the dome hot enough to solder. 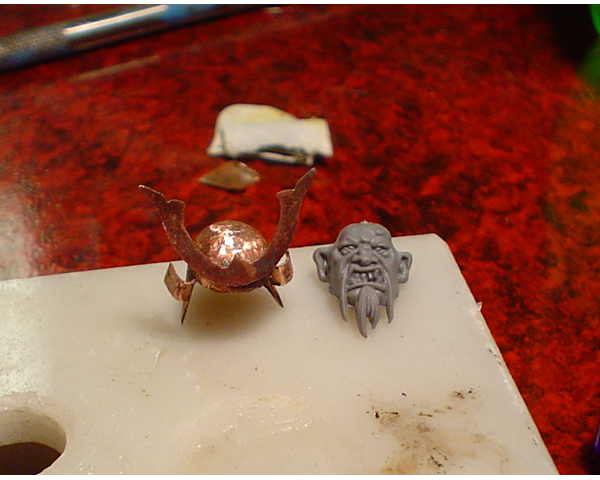 Now I have a good foundation to sculpt the details of the helmet. 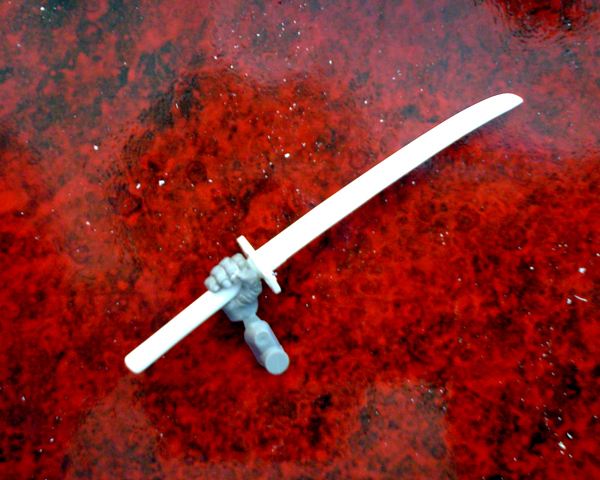 [pagebreak]A katana to replace the club carved from plastic. 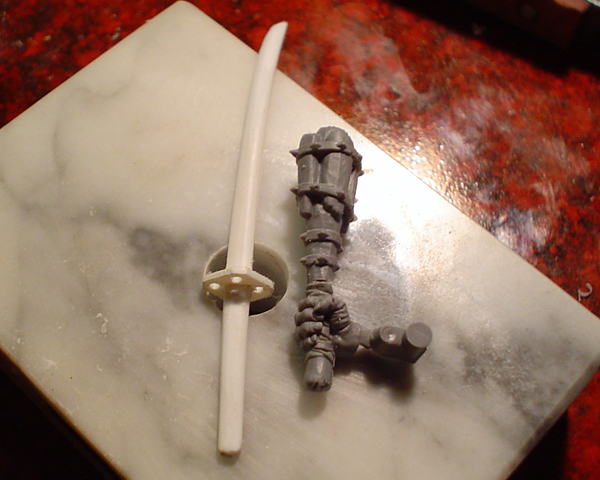 Here is the hand drilled with a pinvise and carved out to accept the sword. The arms need to be modified for a new pose. 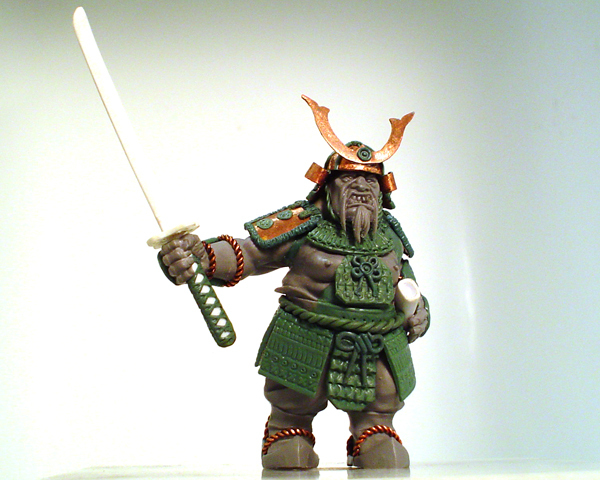 I want the sword raised and the other hand on the saya (scabbard). 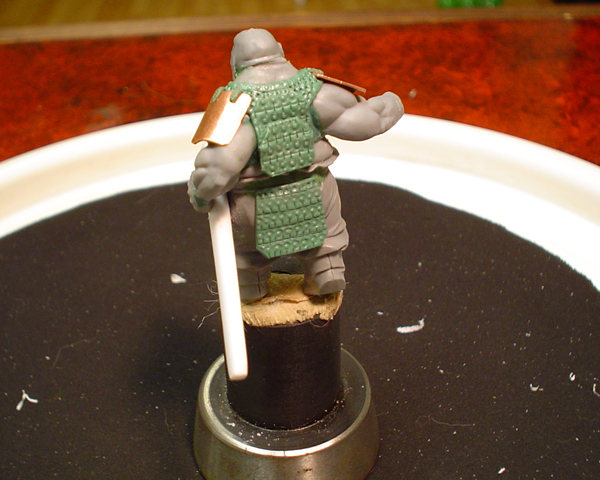 The shoulders on the back of the model are going to require the most work. 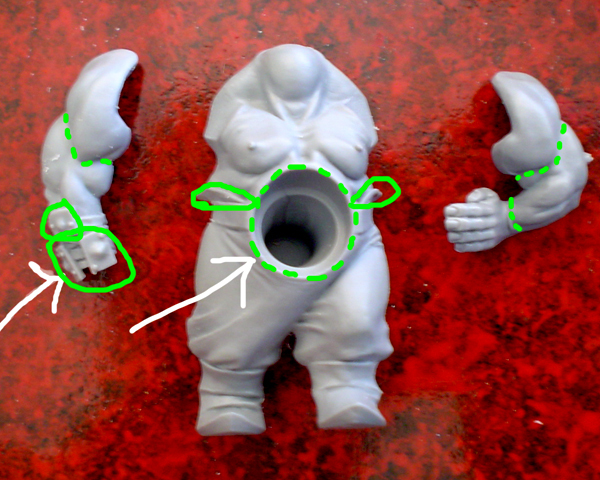 The sculpting is really nice and I hate to cover it all up. Partial chest and arm armor is the plan. The green areas need to be cut or shaved off. 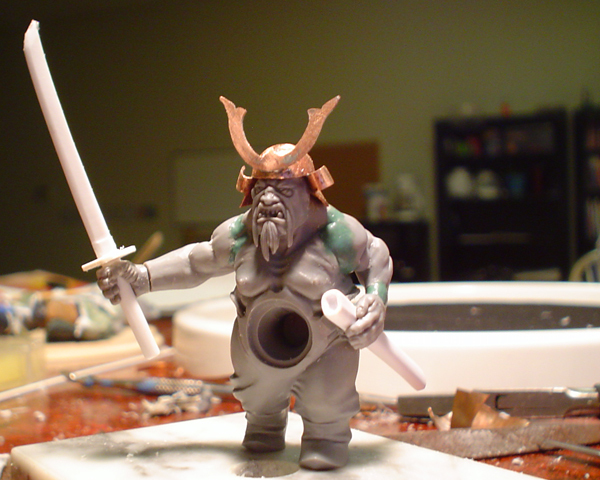 and now a bunch of sculpting. 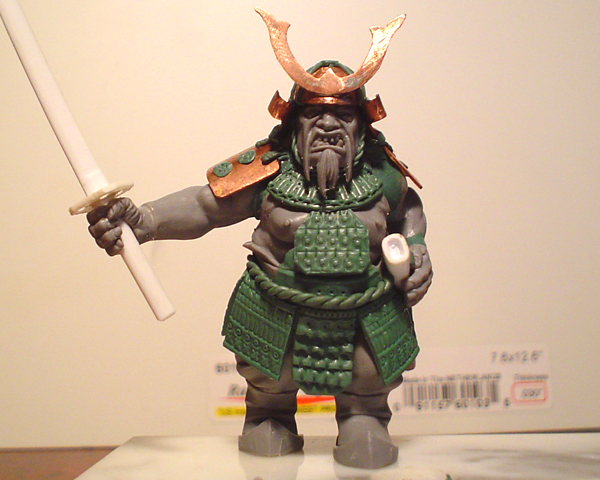 The main pose is glued and puttied. Time to start making armor and details. 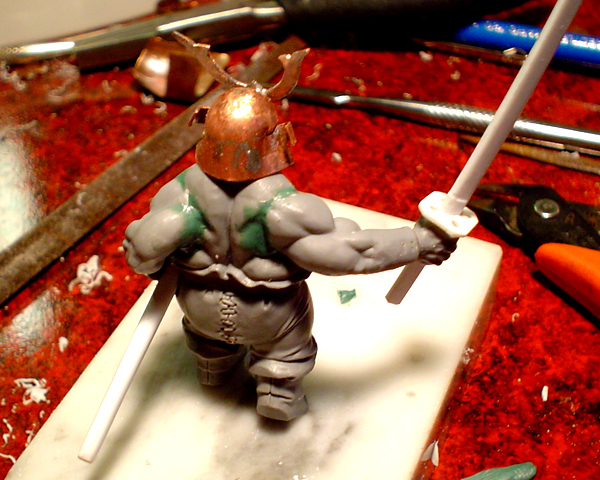 [pagebreak]I started making the armor and made a couple of stamps to speed things up. 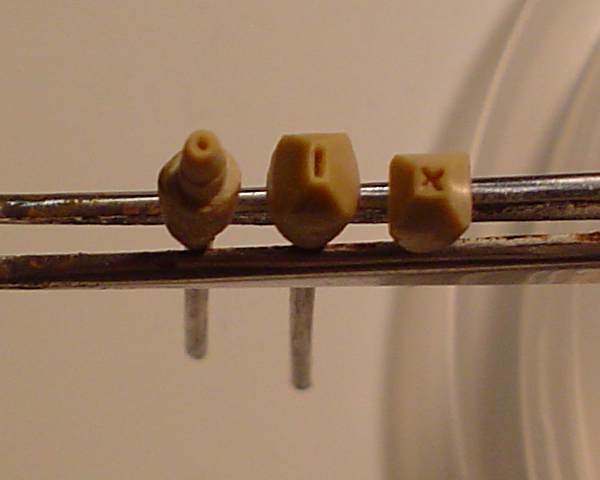 The stamps are made from Tamiya putty. Press the pattern into the soft putty and let harden. 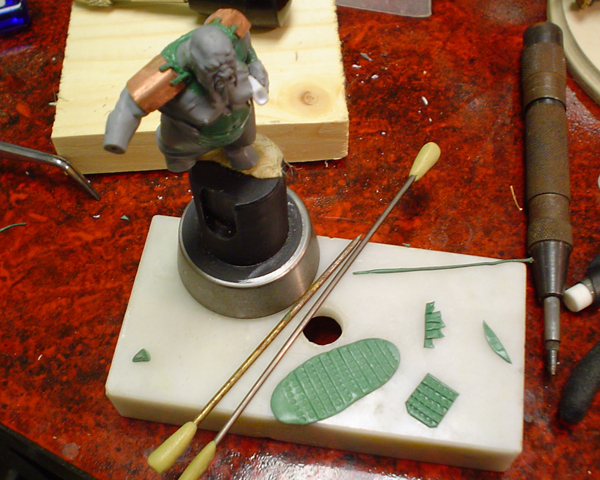 Then, carefully carve away the putty down to the shape. The one on the right is finished. Repeating textures are a breeze with a stamp. A little more on the stamps. 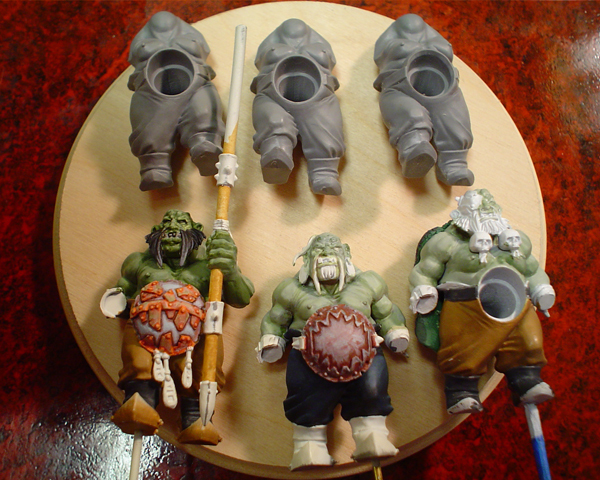 I like to use Tamiya putty for the stamps because it dries rock hard and keeps a plastic quality. The first step is to mix a ball of putty and roll it around the end of a piece of wire. Slightly flatten the stamping end on a smooth surface. 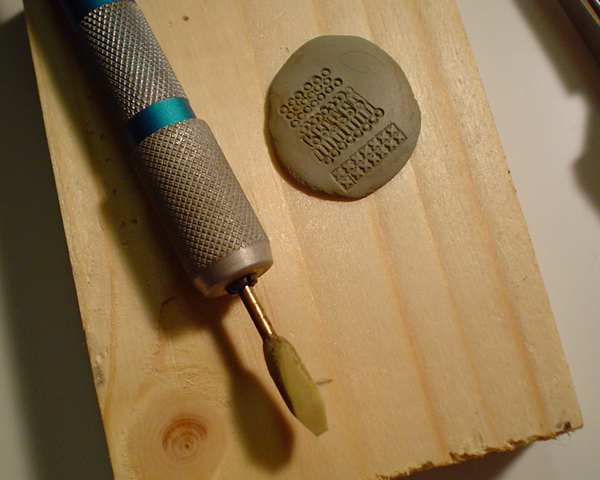 Then, press the shape you want to stamp into the putty or press the stamp onto a surface you wish to copy. For this example, I wanted a "+" stamp to make the cross stitching found on Japanese armor. Let the putty completely cure before moving on. Next, File the end of the stamp perfectly smooth. Finally, cut/file away the putty to the desired shape around the design. 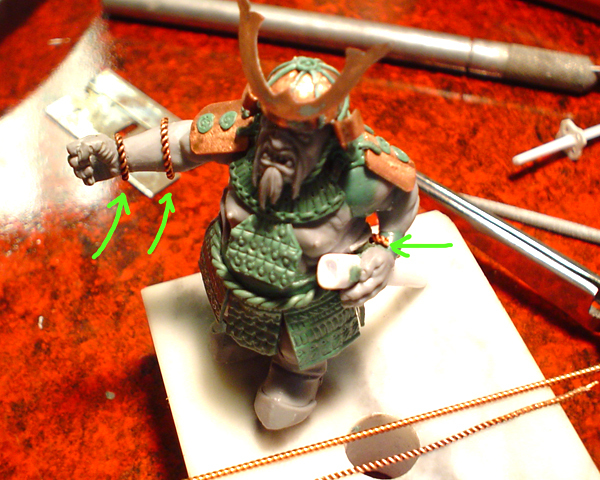 For this example, I wanted a "|", "+" and "o" to use on the armor. 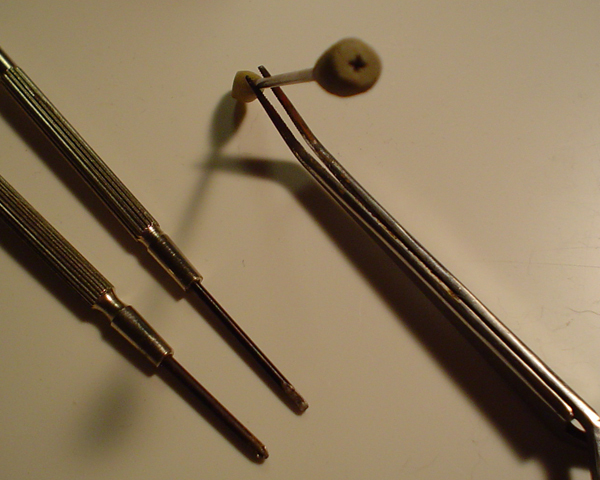 I like to cut the wire to a short length and use the stamp in a handle that came with a set of needle files. 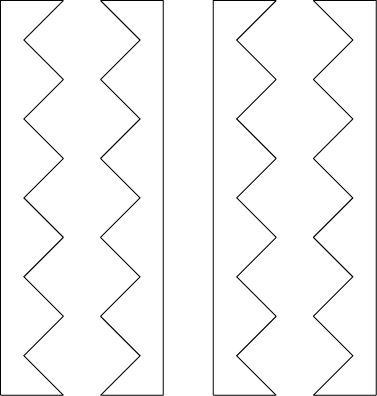 It's easy to do uniform repeating patterns with this method. 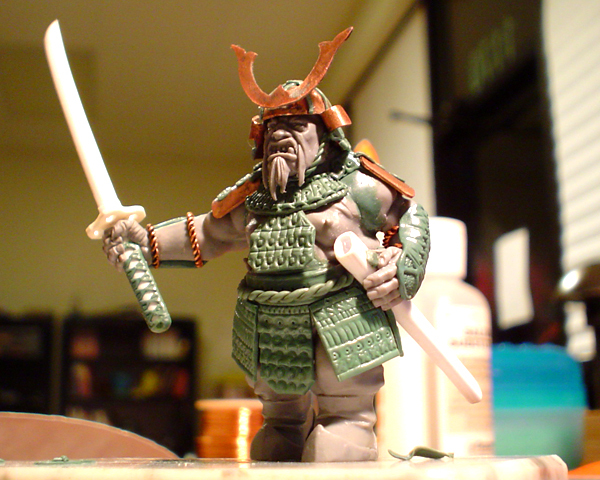 And finally, some of the armor applied. That's it for tonight. 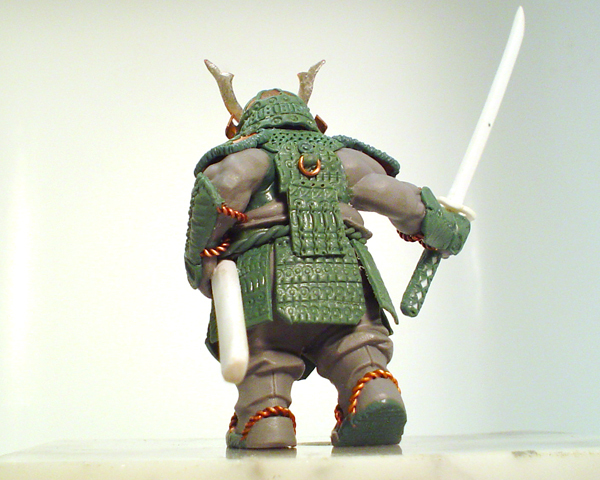 A run of skirt armor and neck protection. There are a couple of braids off to the side. 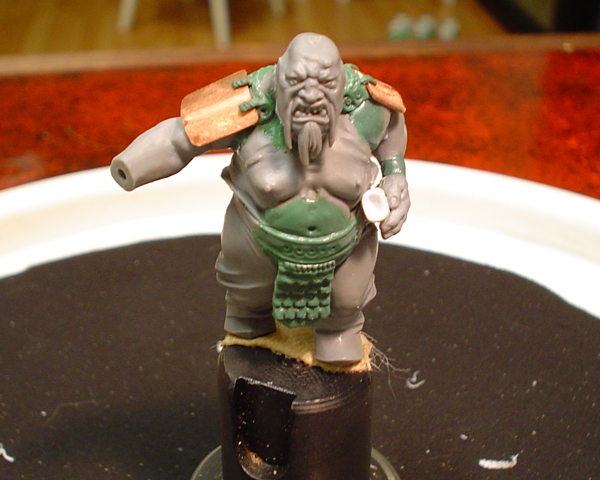 A belt, chinstrap and a few more bits of armor added. [pagebreak]I made some ropes out of copper wire to start tying things down. I'm sure everyone knows how to do this. 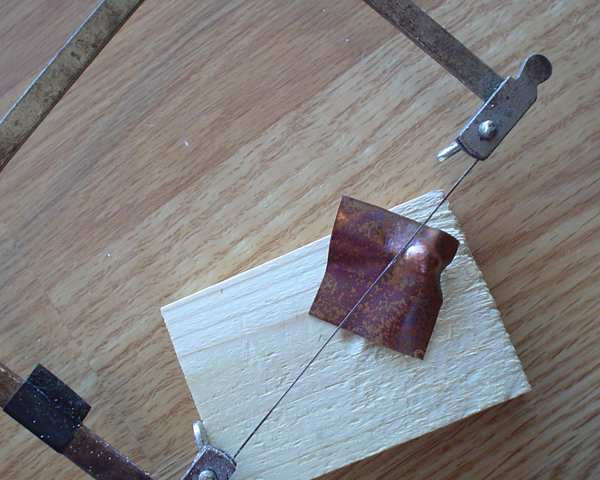 I take a couple strand of wire and clamp them into a pin vise. 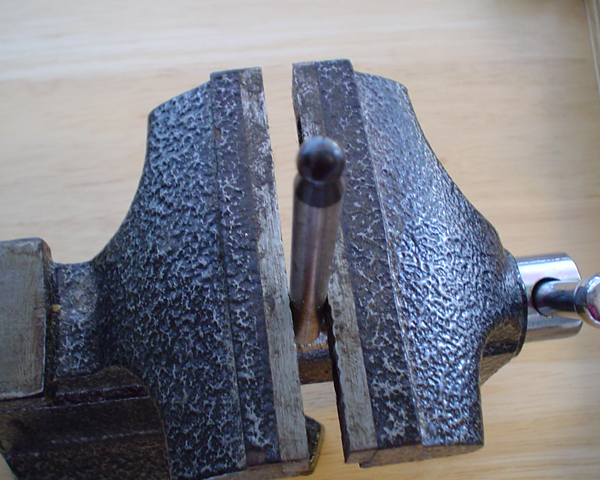 Secure the other end of the strand in a vise or similar and twist away. Anneal the rope after you twist it and it will be as soft as solder. I used a little space aged plastic welder to tack the ropes to the model. This isn't a final bond, but just to hold it in place until I can sculpt gs around it to hold it. This is about it for the night. 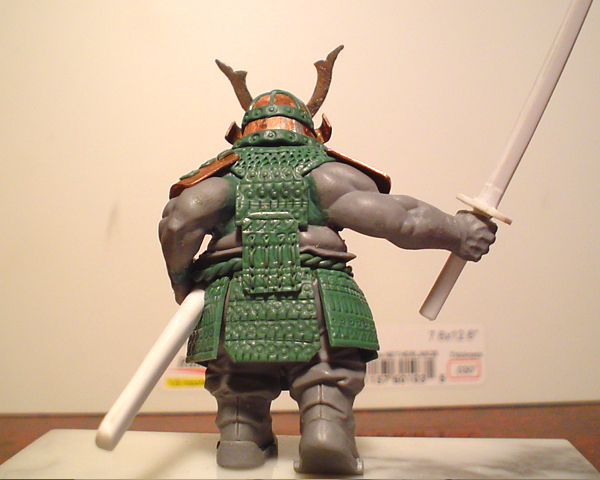 Forearms, back of helmet and tsuka on sword. 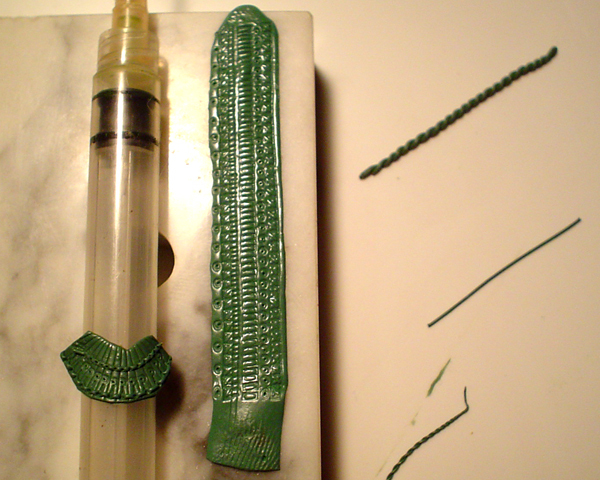 [pagebreak]To make the wrap on the sword, I mixed some gs, let it sit for 30 minutes and then cut 4 pieces like this. Then I sculpted the folds into the wrap. Many small details can be broken down into simple shapes. 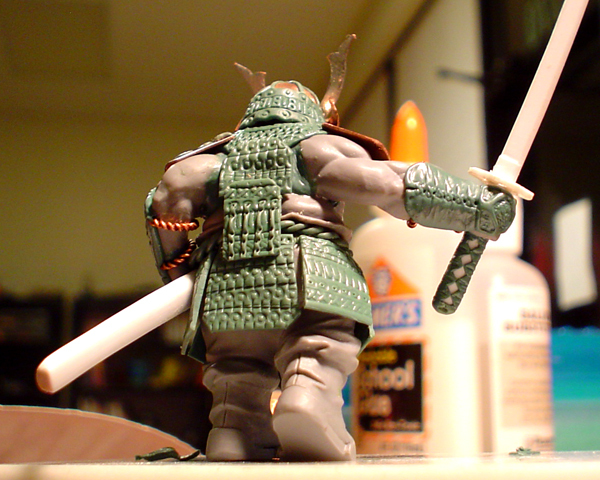 When I made the katana, I knew I wasn't going to make a mold so I could get away with using styrene plastic. I also didn't have to worry about undercuts, so I could leave the armor hanging free from the model. 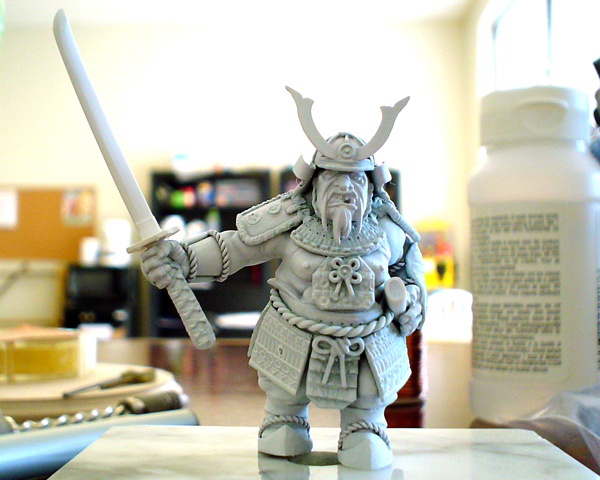 There is a lot more freedom doing one time conversions than preparing a green for molding. [pagebreak]Well, I think this guy is about done. If anyone can think of something in particular they would like to have explained, please pm me. Fantastic! I loved that you made the armour out of metal. That was really cool and a big eye opener for me. I learned and I appreciate it immensely. Stay Frosty you cool dude! Awesome job, great ideas for working green stuff !